Could it make sense to align the No. 1 broadcaster with a struggling portfolio of cable channels and a movie studio? 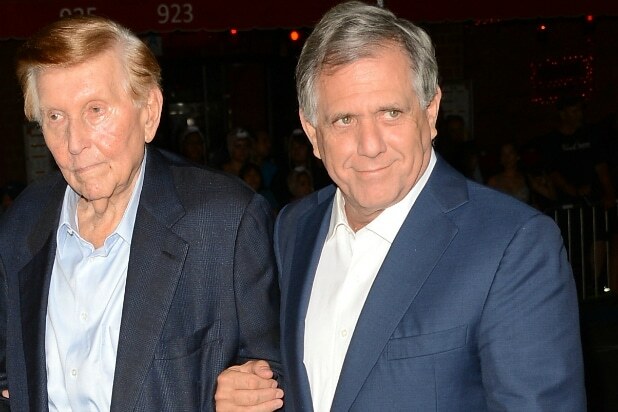 Sumner Redstone and Les Moonves at Mann Bruin Theatre on October 1, 2012 in Westwood, California. If CBS winds up having a shotgun wedding to Viacom, what would that mean for both media giants? A merger is in play after National Amusements, Inc. on Thursday proposed recombining the companies, which split in 2005. 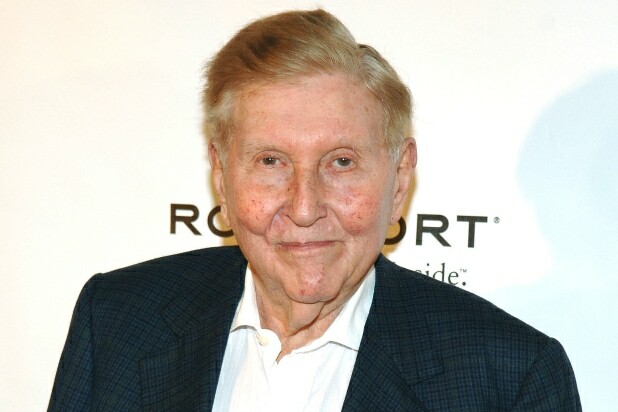 NAI controls both entities through “supervoting” shares held by the ailing 93-year-old mogul Sumner Redstone and his daugther, Shari. But this arranged marriage would come with plenty of headaches even before the honeymoon. Viacom has endured months of painful boardroom turmoil, ultimately booting its chief executive and other top managers as the Redstone family jockeyed for control. CBS Corp., for its part, is run by outspoken Leslie Moonves, who has made it clear he favors keeping the broadcast giant as a standalone company, even though he would be the likely candidate to run the merged companies. A CBS spokesman wrote Thursday that its management had seen the NAI letter and would “take appropriate action to evaluate what is in the best interest” of the company and its shareholders. So it’s safe to say that CBS isn’t exactly eager to rush into the warm embrace of Viacom. It’s ironic that Viacom is seen as the weaker partner since it has a collection of once-hot cable brands like Comedy Central and MTV (and a movie studio, Paramount, that has been stuck in last place in market share among the major studios since 2011). But CBS has doubled down on broadcast and boasts the most-watched network in the world. As unlikely as it may seem, cable needs help from broadcast. That’s the phrase NAI used in its Thursday letter touting a merger. In other words, the combined companies would save so much money by eliminating overlapping operations and increasing efficiency that a marriage would yield instant benefits. Indeed, media analysts at MoffettNathanson estimated cost savings of “at least” $400 million. But on the downside, that would likely mean layoffs for hundreds of employees. And “synergy” is the same buzzword that was used to sell a lot of media mergers from the Internet 1.0 era that didn’t pan out, such as (cough) AOL Time Warner. Or so the analysts call it. What that means is that CBS, due to must-carry government regulations, wields enormous clout with multi-channel distributors. As consumers shift more toward on-demand viewing, that clout matters more and more. If cable operators decide, for instance, to offer consumers “skinny bundle” packages that dump MTV, CBS could theoretically press for better terms. Theoretically is the key word there, however. TV remains a hit-driven business, and what ultimately succeeds are programs that people want to see, not struggling networks that get strong-armed onto a cable menu. Some analysts believe that he could work his magic on fading Viacom brands like Comedy Central, which has been hit hard by the exits of Jon Stewart and Stephen Colbert. The only problem is that rejuvenating Viacom is a job Moonves doesn’t seem to want. “We are doing extraordinarily well on our own with our own assets,” he told an investor conference earlier this month. Translation: I don’t really want the crud in your garage, Sumner. Marci Ryvicker, an analyst for Wells Fargo Securities, understands Moonves’ reluctance. “We just don’t see how any exec can come in and turn this around in the next 12 months,” she wrote of Viacom in a note this week. Translation: Nobody wants this crud. But here’s maybe the most important point to remember: The Redstones control Viacom and CBS. And you know what they say about possession. Ultimately, Shari and her father will get their way. The only question is what the media landscape will look like once they’re done.